during practice for the Monster Energy NASCAR Cup Series Folds of Honor Quiktrip 500 at Atlanta Motor Speedway on February 22, 2019 in Hampton, Georgia. 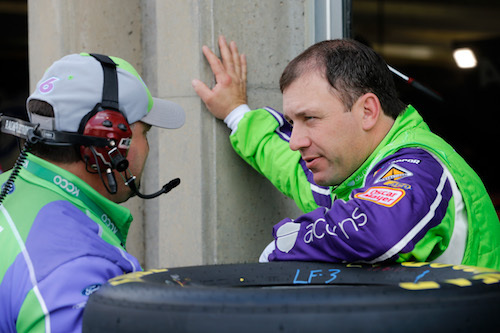 Ryan Newman and the No. 6 Roush Fenway Racing team will be without car chief Todd Brewer for the remainder of the Auto Club Speedway race weekend that will culminate in Sunday’s running of the Auto Club 400 for the Monster Energy NASCAR Cup Series. Brewer was ejected from the track’s garage/pit areas as a result of the No. 6 car twice failing pre-qualifying inspection Friday. As a result of the inspection issue, Newman and the team also will be docked 15 minutes in final practice Saturday. Final practice is scheduled for 3:30 p.m. ET. Newman qualified seventh for the Auto Club 400.